Another day, another town centre shop closes. But this was truly a blast of a decade past – from the days when fridge magnets and scented candles were everywhere. Evolution specialised in items of trivia. Quirky, sometimes artistic but just about everything on sale was something you could very easily do without. A town that fails to value the independent stores, Reading (perhaps like everywhere) has a bizarre knack of embracing the frivolous. Look at the junk in Debenhams and BHS before Christmas and you can hardly imagine a need for a retailer specialising in it. So for once it might just be an occasion where a retailer can leave the space for another which might just bring more purpose. 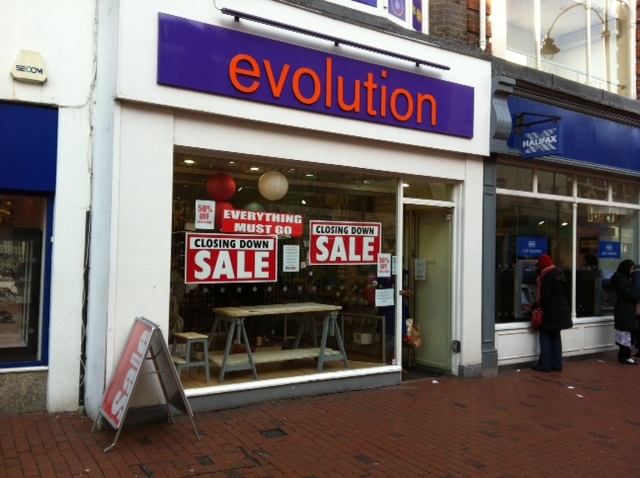 Although judging by the queues of people buying up Evolution’s sale stock, you might wonder.